Published June 19, 2015 By Anna T. This post may contain affiliate links. Regardless, I only recommend sites I've researched and/or used and trust. I'm sure that most of you know you can earn money selling your stuff on Amazon in a way similar to eBay — listing items directly and then shipping them to the customer once the item is purchased. But did you know that there is another way to earn money on Amazon that doesn't involve you shipping to the customer directly? It's called Amazon FBA (Fulfillment by Amazon). With FBA, you send the items you want to sell directly to Amazon and they handle shipping to the customer once your items are accepted and listed. You can start off sending in your own stuff you want to get rid of, and once you've exhausted your own supply, use some of the money you earn to “treasure hunt” and seek out thrift stores, yard sales, and even major retailers to find things to send in that you know you can resale for more. Is it really possible to earn much money with FBA? It definitely is if you take the time to really learn how it works and understand what types of items you can usually make a profit on. Over the past few weeks, I've joined lots of Facebook groups for FBA sellers because I was a little interested in doing this myself, and it's become apparent that a large number of these people are making more than just extra money. Some have managed to completely replace their day jobs. 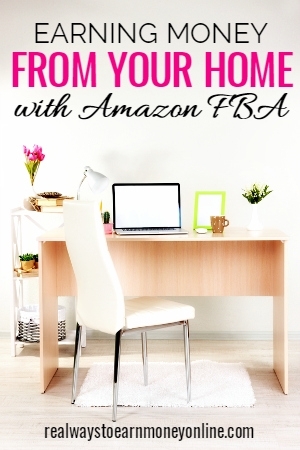 What makes FBA a better option than selling directly to buyers on eBay or Amazon? Using Fulfillment by Amazon has made a HUGE impact on our business for many reasons. First and most important is that our time is limited in any given day. So, using fulfillment by amazon and having them pack and ship our sold orders meant that we could continue adding inventory, without adding more time to the individual order process. Anyone selling on eBay will be able to relate to the double edge sword of listing more items. You get more sales, but then you also have to ship out more orders. The second, is that Amazon buyers trust the FBA system. They know that if an order is being fulfilled by amazon that they will receive it on time and that if there are any problems they can return the item no questions asked. Prime buyers pay for a membership so that they can get free 2 days shipping, so if there is an option for an item that is FBA they will usually choose it over a merchant fulfilled order because they get the free shipping. Is it possible to get started with no money and if not, roughly how much is it necessary to invest in the beginning? It is possible, but definitely harder if you are starting out with no money at all. It's just important to remember that we have to ship the items to Amazon, so there is an immediate cost of the shipping supplies, as well as the shipping cost. Amazon gives us great rates for shipping to them, but it is still a cost that needs to be paid. In our free video series, we have a video that shows people how to find their first inventory items from their own home. Basically giving them free inventory to start out with. Ideally, I recommend that people have $500-$1000 to invest. This will cover education (optional of course), supplies for getting started and a good supply of inventory. Can you tell us how getting paid by Amazon works? Do they take out fees, etc.? Getting paid is the easy part. 🙂 When you set up your seller account you provide your bank account information and Amazon pays via direct deposit. New accounts are set up with payments every 2 weeks. There are fees associated with selling on Amazon, but there is no cost to list items on Amazon. You are charged when the items sell. There is a great tool at fbacalc.com that will show all of the fees associated with any item listed on Amazon. So, you can bring up any item you are interested in selling and see the fees before sending them in. As a general rule of thumb, you can assume that Amazon fees will be around 1/3 of the sales price. This is very general and can go up/down depending on the price. Using the calculator is the best way to start understanding the fees. Is this something that pretty much anyone can do, or is it necessary to have a certain skill set prior to starting? Pretty much anyone can find success selling on Amazon. There are a few things you should know upfront though. You will need to have access to a computer with internet and a printer. This is a business that does require having inventory and waiting for it to sell. A lot of sellers buy lots of inventory up front, and it takes time for it to start selling at a pace to keep up with buying. So, I recommend that people don't expect to see a true return for about 3 months. If you want to do in store sourcing, you will need access to a smart phone with internet connection as well. If you want to do online sourcing, which we cover in our Amazon Boot Camp, you can get away with not having the smart phone. How long does it take most people who really put the effort in to turn this into a full or even part-time income? The biggest factor that goes into when people will start seeing a profit is how much money they have to invest. If you have $300 to invest, it will take more time to get to a full time income than someone with $5,000 or $10,000 to invest. There are a lot of factors that go into how quickly you will double your money, like the ROI you get on your items. Some sellers are happy with 30% ROI and some are happy with 100% ROI. I won't try to get into all of that right now. The easiest answer would be to say that you should be looking to spend the same amount that you want to make in profit every month. So, you want to make $3,000 a month in profit, you need to be spending $3,000 a month in inventory at least (assuming your items double your money). For anyone who thinks this business model could work for them, we would like to invite you to get our free 7-day email course about selling on Amazon FBA. We will explain exactly how and why the business model works, help you set up your seller account and then walk you through finding some seed inventory from your own home! Thanks Jessica for taking the time to answer these questions! If you're interested in becoming an FBA seller, definitely sign up for their completely free 7-day email course. This will help you kind of wrap your head around how it all works. Thanks!!! You just helped me. Thanks for sharing our story. Amazon has been a game changer for our family and there is so much potential for new business owners! Very useful information. I was thinking of starting my online business through Amazon only yesterday and this blog post has helped a lot. Many thanks. I have been looking into this recently. This seems like a lot of work to set up but with a blog or Shopify store in the right niche, yeah, it’s a great idea!! Thank you very much for the insight! It’s very helpful! I’ve never sold through FBA before, but I have sold on Ebay, so this is definitely worth looking into. Thanks for all the great info.